This is more of a personal post. Forgive me for straying from the subjects of photography and travel. This past June marked 1 year of living in the Great White North. I intended to mark the occasion with a post, but here we are 4 months later and I’m just getting around to it. Time flies. Times change. I’ve been a very busy beaver (pun intended). Some may speculate that my wife and I made a swift and unexpected move to Canada because of political reasons. While I can’t deny that the deterioration of progressive politics in the U.S.A. and our former home state of North Carolina did play some role in our decision, it was not the sole reason. I don’t believe people should uproot their lives and head to another country in some knee-jerk reaction just because they don’t like who’s in office for the next few years. We weren’t in a situation where our lives were at stake anyway…as white middle class people, little would have changed for us under the current administration. I’d like to clarify further the real reasons for which my wife (a Canadian citizen) and I chose to move north as well as the things we love about living here. Say what you will about the Canadian healthcare system. If you’re American, most of what you’ve heard is made up by politicians to make you believe that paying an arm and a leg to fix your toe is the best way. The misrepresentation of the Canadian system (and European systems) goes so far as to paint a picture that resembles WWI field hospitals in which people are waiting so long for such poor care in such vast numbers that patients are dying left and right. That’s far from reality. Canada has 10 different healthcare systems (each province has its own), each with their own advantages and disadvantages (each with their own problems and solutions to those problems). Overall, the situation is quite rosy through the eyes of someone like me who used to pay $300 a month for mediocre health insurance and still had to pay out of pocket for doctor visits and medications. That monthly sum was set to rise steeply within a year of our relocation and continue to rise throughout my life. Today I enjoy paying nothing monthly and nothing for doctor visits and treatments (Alberta’s healthcare is particularly good based on my experience) and very little for prescription meds. It’s covered by tax dollars. Somewhat ironically, and despite popular misconception, we actually pay less income tax here in Alberta, Canada than we did in North Carolina and we have higher incomes (this fact blows Canadian minds). Our first tax refund for Canada was higher than our U.S. refund for 2017 on more income. In Alberta, sales tax is less as well. The major reason we actually moved to Alberta so abruptly was that my wife, who only casually applied for jobs in Canada, was offered a position that she really couldn’t say no to. It is a couple steps higher up the ladder than her previous job with much better retirement and health benefits (on top of the standard Alberta Healthcare that every resident is entitled to). It gives her the opportunity to work with a more diverse group of students with various needs (she’s in higher education). In North Carolina, she was in a situation where she couldn’t advance in position or salary (thanks to hiring and pay raise freezes by the state legislature). She felt rather stuck. So did I.
I was having a bit of a struggle making photography a full-time gig (or even part-time) in North Carolina. I even quit my day job to put as much time into it as possible. Still, after a couple years, the wheels were turning very slowly. I contributed to our household by heating our home with wood, growing vegetables, hunting game, and even baking all our own bread in order to offset costs. We were actually doing pretty well, but every dollar I made as a photographer was one I had to chase like a wild goose. I was often doing weddings and portrait shoots instead of hiking the woods of Appalachia making meaningful nature images like I wanted. Magazines ignored my emails and submissions. My work barely sold in galleries. For whatever reasons, my Blue Ridge Mountain images weren’t being licensed all that much from stock agencies either (my travel images were doing a bit better). It was time for a change of scenery. 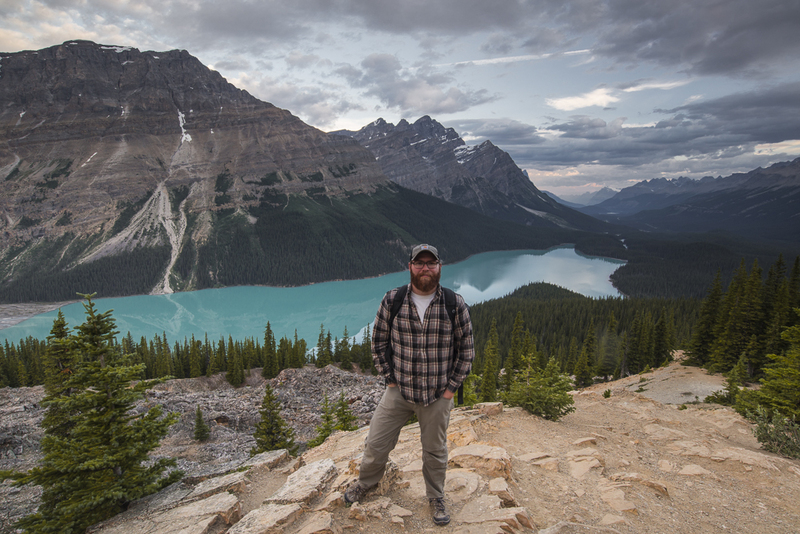 Moving to Alberta meant bigger opportunities (and bigger mountains and bigger wildlife) for the “starving” nature photographer. Not only am I now flush with new subjects to photograph within a short drive of home, there are simply fewer other photographers to compete with. There is no shortage of talented photographers here, don’t get me wrong, but because Canada has a much smaller population than the U.S., that means less competition. And because Canadian publications and companies want (or are required to use) content from Canada residents, that means it’s easier for me to get noticed. I’m no longer competing with every photographer on earth who is willing to give their shots away for free. I’m generally only competing with Canadian photographers for paid work. Also, my stock image portfolios are doing much better as they are now filled with more dramatic mountain imagery and a diversity of wildlife (not to mention lots of new travel imagery). It also helps that there are better tax advantages for the (very) small business person up here than in the states. 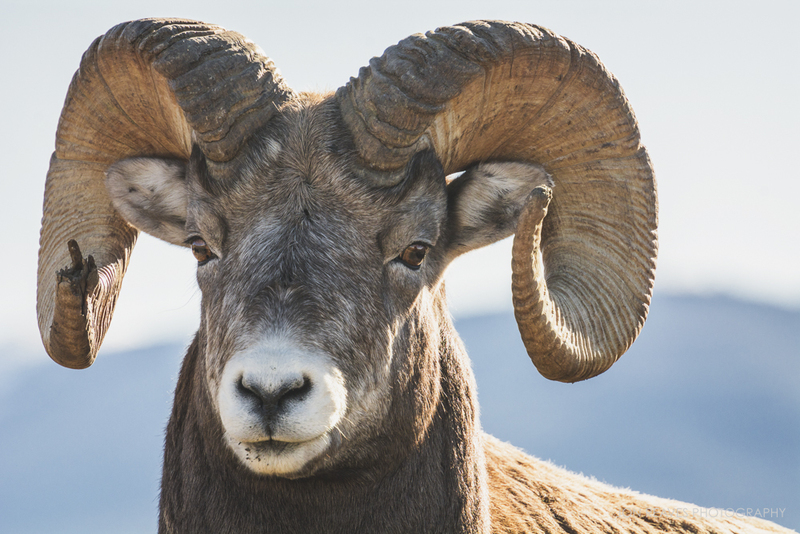 Bighorn Ram portrait, Jasper National Park, 2017. I had dreamed of seeing wildlife like this since I was little, watching Marty Stouffer’s Wild America on Public Television. The next point came as a surprise to us. We can actually travel more cheaply from Edmonton than from North Carolina. Because flights from Charlotte or Raleigh were so expensive, we usually drove all the way up to Baltimore/Washington to fly abroad. Even with the seven-hour drive we’d save $300-500 each for a flight to Europe vs. flying from NC. Now we don’t have to do an extra day of driving to save money. The airport is 30 minutes away, and fares are much more reasonable to most European, Central American, and Asian locations (we flew to Munich last summer for $600 CDN each). We can also fly to any major city on the U.S. west coast and several awesome places in western Canada for as little as $200 ‘round trip! That means I can travel more frequently and longer than before. I live way up at the 53rd Parallel in Canada’s most northern provincial capitol, and yet some days I can still not hear a word of English (or French) spoken in the downtown area. Canada is diverse. Of course, the U.S. is also. But a respect for diversity is a firm pillar of Canadian society and not a dividing factor in politics. I’ve sensed almost no xenophobia here (and a lot less political tension in general). The advantages of living in a culturally diverse place is that there are lots of great restaurants and festivals to attend (and photograph). And lots of different perspectives to influence legislative decisions. I wouldn’t call it a “melting pot.” It’s more of a mosaic. The current Prime Minister described Canada as the World’s first “Post-National Country.” Having spent over a year here I can understand why that is. While in the states there are loose laws to protect people from discrimination, Canada’s acceptance of diversity (and celebration of it) is built into the fabric of society as well as in the Charter of Rights. It became very tiring living in rural North Carolina, where many people had never even seen an Asian in real life. To be sure, Canada faces a lot of the same issues as the U.S. (immigration, environmental, economic, etc), but it tends to go about dealing with those issues in a much more level-headed and dignified way. We moved to Canada, for very specific and practical reasons. We had a short time to make a plan, but we pulled it together. It wasn’t an impulse decision. It wasn’t easy, either. We had to prepare and list our home for sale in a stale real estate market (luckily it sold within a couple months). We had to get rid of about 80% of our belongings through sale, donation, and storage in a short amount of time. We made the four-day drive up with our two dogs and only what we could fit in, or on top of, our small SUV. I had to go through the complex and expensive process of applying for permanent residency, which took 6 months to achieve with lots of ups and downs along the way. Thankfully, all of that hard work and stress paid off. After our house sold, we began a path to stronger financial stability. We’re almost completely debt-free (we chose to rent instead of buy again). We no longer feel burdened by the stress of a politically volatile environment where people no longer respect differences. My wife is enjoying her new career and my photography business is growing steadily (thanks largely to readers of this blog!). We’ve also survived our first Canadian winter…Things are good.